LIVE ON organ donation – Why Living Donation? LIVE ON organ donation > About the Need > Why Living Donation? The facts are the story. Here are some basics, courtesy of organdonor.gov – a website worth spending some time with. The good news: an average of 79 people receive organ transplants each day. There are enough people waiting for an organ to fill a large football stadium. Twice. And the gap between donors and those in need widens. As a result of the mismatch between need and availability, living donation has increased as an alternative . The first successful living donor transplant in this country happened in 1954: a twin donated a kidney to his identical twin. About 6,000 living donations take place each year. Most, but not all, are among family members or close friends. What organs? Living individuals can donate one of the two kidneys. The other kidney provides the necessary function needed to remove waste from the body. A living donor can donate one of two lobes of their liver. How? Liver cells in the remaining lobe of the liver grow or regenerate until the liver is almost its original size. 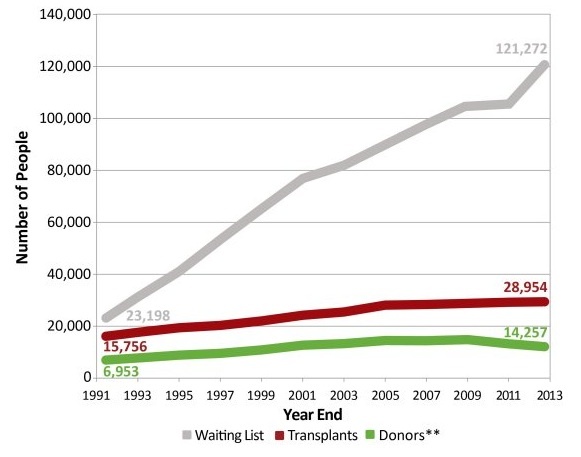 This re-growth occurs fairly quickly in both the donor and recipient. Living donors can also donate a lung or part of a lung, part of the pancreas, or part of the intestines. These do not regenerate. But the portions remaining and donated remain fully functioning. Our belief, based on these facts: Right after a family learns of the need for an organ, they learn quickly about the lack of organ availability. It can be devastating news. At that point, some explore living donation. It is a big decision to be made based on facts, research and in consultation with medical professionals. If someone concludes it is the right path based on their circumstances to try to save a life, and they qualify to do so, giving them a hand allows less worry about unavoidable and out of the ordinary expenses, and more focus on the transplant, recovery and getting back to health.